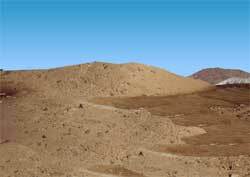 They are one of the driest places on earth. Rainfall has been extremely rare during the past two million years. When NASA noticed a similarity between the ultra dry landscapes of Mars and the Dry Valleys, it decided to conduct research in these desolate Antarctica valleys in preparation for its Viking missions to Mars. One reason is the atmosphere is so dry that it rarely snows. When it does, the snowfall is sparse and evaporates quickly. The second and most important reason is that mountains block the path of glaciers that would otherwise pass over the Dry Valleys. What glacial ice reaches the valleys is skimpy and evaporates within several weeks. If it were not for the mountain barrier, the Dry Valleys would be buried under the ice cap, as is most of Antarctica.